While this year, Davis serves as chairperson of Give Kids A Smile at UNC, he worked on the treatment side the past two years as a graduate student. Since its launch in 2003, the Give Kids A Smile program has provided more than five million children with access to free oral health care. According to statistics from the Centers for Disease Control and Prevention, children aged 5 to 19 years old from low-income families are twice as likely to have cavities when compared to children from wealthier families. In an effort to improve dental health in lower-income families, the Give Kids A Smile program works to educate children and their families on the importance of early childhood oral health. During Friday’s event, up to $ 8,000 worth of oral health care will be provided to local children by students in the dentistry school. Available care includes dental exams, X-rays, cleanings, extractions, sealants, fluoride, fillings and crowns. Walk-ins will be accepted until 1 p.m., and children must be accompanied by a parent or guardian throughout the duration of their appointment. 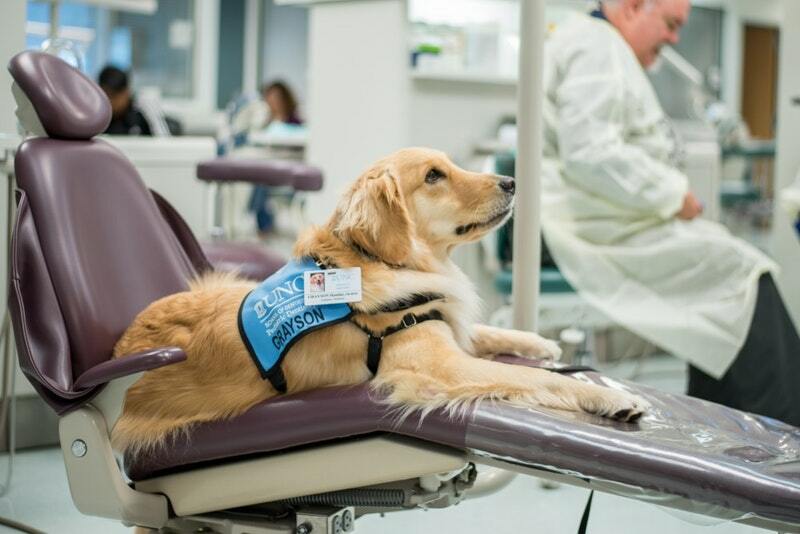 The dentistry school’s rehabilitative facility dog, GRAYSON, will also be on-site during Friday’s Give Kids A Smile event. “Going to a dentist can be real anxiety-provoking for children, especially the real young ones that might be in pain,” said Dr. Jessica Lee, chairperson of Pediatric Dentistry at UNC and GRAYSON’s secondary handler. GRAYSON joined the School of Dentistry team in October 2018, and has been helping many pediatric patients through treatments since. In addition to providing free dental care, Friday’s event will host a health fair focusing on full-body health. The fair, sponsored by the dentistry school, will include participants from the UNC School of Medicine, the UNC School of Nursing, UNC Eshelman School of Pharmacy, the UNC Gillings School of Global Public Health and UNC Athletics. Stations within the fair will be aimed toward children, providing education on proper ways to brush teeth and how to engage in an overall healthy lifestyle.